Getting yourself financially positioned to get a mortgage and purchase a home often takes time and effort. Many things need to line up including your employment/income, credit history, and down payment to name a few. This comes easy for some, and for others there are specific things you would appreciate knowing well in advance of applying for a mortgage so that necessary corrective action is possible. It's comforting to know you are headed in the right direction, and that's the goal of our team - to help you buy your first home. 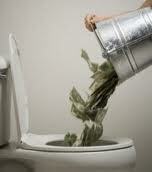 Every month that you wait, you flush your hard earned rent money down the toilet. Renting is wasting money because you don't control an appreciating asset. However, if you put those rent same dollars into a house payment instead of rent, you create equity ... value that you own, that later can send your kids to college, finance the start-up of your own business, or pay for your retirement. Be your own landlord and build up future financial security. We'll even show you easy strategies to speed up the payoff of your home without making extra payments. There's no reason to wait. We can help put you in a home right now or very, very soon. Switching from renting to home ownership can help you go from dependent on your landlord to financial security. You can use home ownership as the foundation of a complete change in your overall finances! Before anything else, you need to know can you even qualify for a mortgage, then how much you can afford. The availability of mortgage financing is obviously important to your purchase plans, and each mortgage lender has their own lending guidelines, or Rule Book. Besides the lenders' Rule Book, there is another set of rules whenever you have less than 20% down payment, as your lender will need Mortgage Default Insurance. Having the right team in your corner can make all the difference when it comes to buying your first home. Your home buying team can bring a wealth of real estate experience and expertise that will help make the process as simple and straightforward as possible. Team members will often include your Realtor, Lender or Mortgage Broker, Home Inspector, Appraiser, Lawyer, Insurance Broker, Land Surveyour, and Mover. Often you will find that your Realtor and Mortgage Broker can provide top quality referrals to professionals they have good success with. Obviously there are more details and a lot more to it.